Each stone has its utility. The shape, consistency and quality of a diamond stone are all factors which highlight the fact that two diamonds will never be alike. This is precisely why K&Y Diamond uses the particularity of a stone to create unique tools that meet your specific application needs. 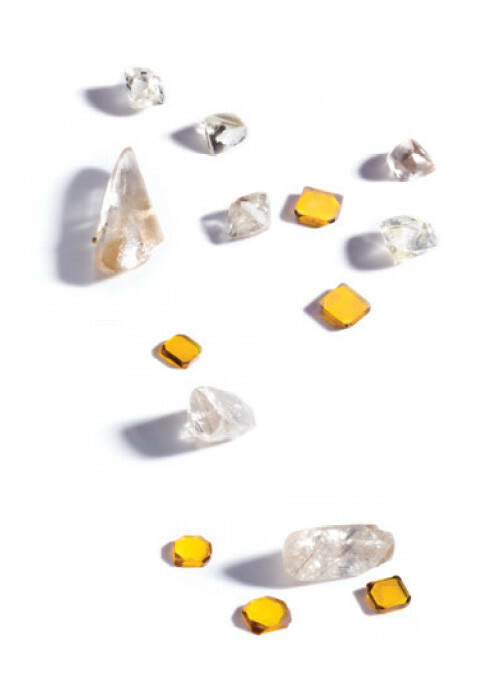 From industrial diamonds to the purest natural ones, K&Y Diamond offers a selection of precious gems of very high quality for all your projects. A natural diamond has the benefit of being a single crystal and therefore presenting a surface finish close to perfection. Its regularity and flawless edges make the natural diamond an indispensable tool for the machining of challenging materials such as aluminum alloys, silicone, plastics, Germanium, Nickel and much more. Synthetic diamonds have the same characteristics as the natural ones and can even be more efficient depending on the kind of application needed. They are created in laboratories thanks to innovative processes that tend to replicate as perfectly as possible the natural structure of the diamond. More consistant, they also offer a more uniform tool life. K&Y Diamond offers an array of quality synthetic diamonds with a different resistance capacity depending on your application. The HPHT method is one of the two methods used in the production of synthetic diamonds. It consists in the combination of very high pressure (5 GPa) with very high temperature (1,500°C) using a press specific to the process. Among the techniques used to manufacture synthetic diamonds, K&Y Diamond offers gems resulting from what is called the Chemical Vapor Deposition (CVD). CVD is a technique that allows for the creation of synthetic diamonds in laboratories with a purity similar to natural ones. Unlike the HPHT method, the CVD method requires no high pressure for the creation of the crystals. Gases like hydrogen and methane are heated to very high temperatures to release carbon atoms that will cover the diamond substrate and create synthetic diamonds. CVD diamonds are perfectly identical to natural ones and are among the purest synthetic diamonds. Their level of resistance can vary according to the final application. Contact our team of experts to know which crystal is best for you.